NOT compatible with Fenix 5 / Fenix 5X. Compatibility:Garmin Fenix 5S It is not compatible with Fenix 5 / Fenix 5X. Available for both casual and business, sports and life. And it is perfect for gifts with fashionable appearance. There is no need to worry about rust and fading material. It is plated and can be expected to be durable without deteriorating even if you last long. Please check the model number of your watch before purchase. Also note that the watch body is not included. The Quick fit buckle is used for quick release .Quick release buckle is attached so you can instantly detach it. You can use it for a long time with high quality material and fashionable appearance. We are strict in product quality control, but please feel free to contact us if there are any scratches or defects by any chance.We will correspond promptly to change or refund. Image and the real thing (color, pattern etc) may be different depending on the personal computer environment. 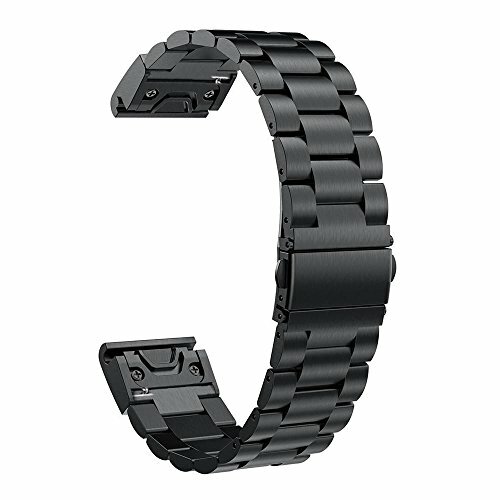 ▲Top quality stainless Steel with stylish superior craftsmanship,it will be comfortable touch feeling on your wrist, wear-resisting, high hardness and corrosion resisting. ▲Size: fit wrist size 5.5~8.7inch(140-220mm). Easy to adjust for a perfect fit.Removal tool kit included in the package, easy to remove the links and provide the best wearing experience. ▲Multiple Color to Choose: Multiple color for you to personalize your watch with this stylish metal strap that is a fashionable and comfortable choice for both women and men. ▲Warranty: For 12 months after the date of purchase, we take care of all quality-related issues with a replacement or full refund. Pls contact us at the first time if you got the defective item from our store. If you have any questions about this product by Yooside, contact us by completing and submitting the form below. If you are looking for a specif part number, please include it with your message.